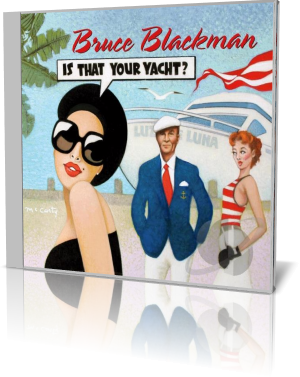 Bruce Blackman - Is That Your Yacht? Bruce Blackman aims to please. He rarely, if ever, misses his mark. And he scores again with Is That Your Yacht? (Starbuck Music, 2017). The musicians are Blackman, lead vocals, keyboards, percussion and bass; other vocals: Jerome Olds, Jim Tice, Lina Kawar-Machaelides, Sarah Blackman, Meeko, and Cheryl Wilson; Randy Hoexter, keyboards and strings; Bo Wagner, percussion and vibes; Larry Cianelli, percussion and bass; James Cobb, bass; Atlanta Symphony, strings; Robert Taylor, guitar and violin; and the Bentley Brass, horns. A coastal location in Spain, the Caribbean or South America may be the setting for the opening track, “Luz De Luna,” or “light of the moon.” It’s a tropical ballad that’s accented by Taylor’s guitar. Blackman sings of a midnight rendezvous with his lover – sneaking away while everyone else is asleep. Starbuck released the single “Moonlight Feels Right” in 1975. It gained more traction when it was re-circulated a year later and has since become Blackman’s best loved song. The original was a moderately paced pop ballad, with most of the instrumentation driven by keyboards, and highlighted by Wagner’s marimba solo. Since then, Blackman has offered different arrangements. This take slows it down considerably. Whereas the original was delightfully romantic, this one is more intimate. With strings in the background, the additional voice of Olds and Wagner modifying his solo, this take on the classic draws out the passion like not before. Starbuck’s “Moonlight” presents the charmer, while Blackman’s “Dreamscape” rendition represents the lovemaker. “Sunset Eyes Symphony” revisits another Blackman classic. The original song appeared on Starbuck’s 1977 album Rock ‘n’ Roll Rocket. This rendition is closer to a more recent remake where a string section replaces all but the lead keyboard from the original, and employs background singers. The other instrumentation is nearly identical to the Starbuck version, including the charming clarinet solo. It’s Blackman’s best love song, and either version holds up well over time. The cover art has a photo of a laughing Bruce Blackman, standing before a portrait of himself during his Starbuck days, complete with white driver’s cap.